We were very excited to hear that British soul singer Joss Stone visited two of our core projects this month as part of her Total World Tour. At Todos Juntos, the incredible dental project we support in Buenos Aires, Argentina, Joss helped hand out school bags filled with vital school supplies to 100 primary school children in the slums. 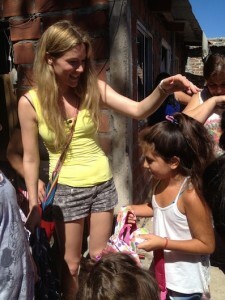 Joss also visited the Friends of Alalay in Bolivia and we are awaiting news from her visit. Look out for more news on our social media channels.